These diamond earrings date from 1938 and include large pear-shaped diamonds (20.66 and 20.26 carats), each suspended from one emerald cut and one pentagonal diamond. 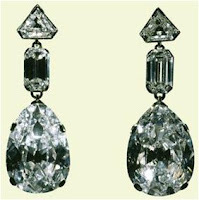 Set in platinum, they came from Cartier and were part of the large jewelry collection of Mrs. Greville, the society hostess that bequeathed her gems to Queen Elizabeth on her death in 1942. 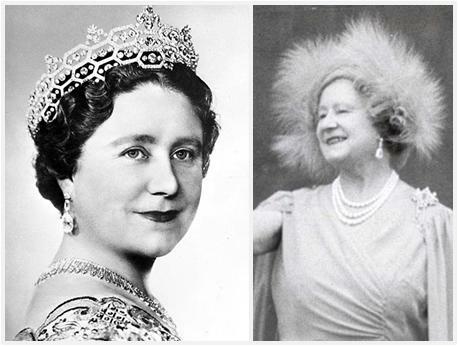 They were among the pieces in the bequest that were destined to become favorites of Queen Elizabeth's, both during her husband's reign and during her tenure as the Queen Mother. She wore them in the evening, often pairing them with the Greville Tiara, and she even wore them during certain special day events. On her death in 2002, they passed to the Queen. They haven't been worn often in public since 2002, but they aren't the only such diamond earrings in the Queen's collection. 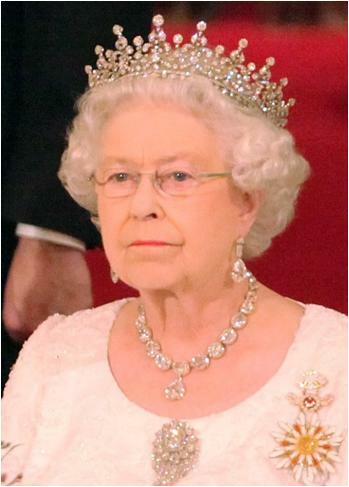 The Queen still seems to prefer the Coronation Earrings when an earring like this is called for.